our perfectly imperfect life: What is it with the garbage? When my son was younger and started understanding what it meant to throw things away in the trash, he began throwing everything away. Shoes, toys, you name it. I'm not sure how many things we didn't catch and really ended up going out with the trash. 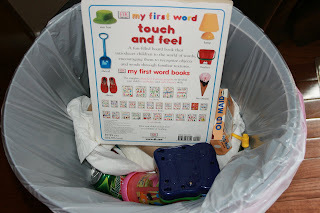 My daughter has understood the concept of throwing things in the trash for quite a while now, but she historically has thought it was more fun to take things out of the trash rather than put things in. Over the weekend, Kyle and I both, on two separate occasions, caught her filling the diaper dekor in her room with clothes. This morning I asked her to go throw away a piece of paper for me ... she did and then she proceeded to empty my purse, item by item, into the garbage. When I caught her, she was throwing my badge away. Uh, not sure how well that would go over with my boss! Do your kids do this? What has been the craziest thing you have found in the trash? I find silverware in the trash all the time, but my one carat wedding ring that had belonged to my husband's grandmother got flushed down the toilet 5 years ago, never to be found. I am still devastated over that one! Kennedy totally does this. Dishes is our biggest thing, when she's done eating, into the trash they go. I've spent so much money replacing sippy cups it's ridiculous! My daughter had a shoes in the trash obsession. We also lost CDs and an Ipod. I am still sad about the Ipod, but nothing compares to a grandma's wedding ring down the toilet :( What a bummer ! Samantha has just discovered one of our trash cans, and has just dropped baby dolls and teddy bears into it so far.